Our wedding activity bags are so popular, that we have expanded the range to include these gorgeous personalised wedding chocolate bars. They make the perfect wedding favours for children, and can be personalised with their names, and a message on the back. The designs match our existing range of printed cotton activity bags, paper activity bags and wedding boxes. You can see them all in the wedding section of the website. What I love most about being self employed is being able to take your ideas and just run with them! My latest product is this commemorative 2012 shopping bag. Made from 100% unbleached cotton, it is a lovely eco shopping bag for life, and carries our special Celebrate 2012 logo. You can buy yours in the Jubilee section. Our "Celebrate 2012" range is now on site. Especially popular are the 2012 personalised chocolate bars. 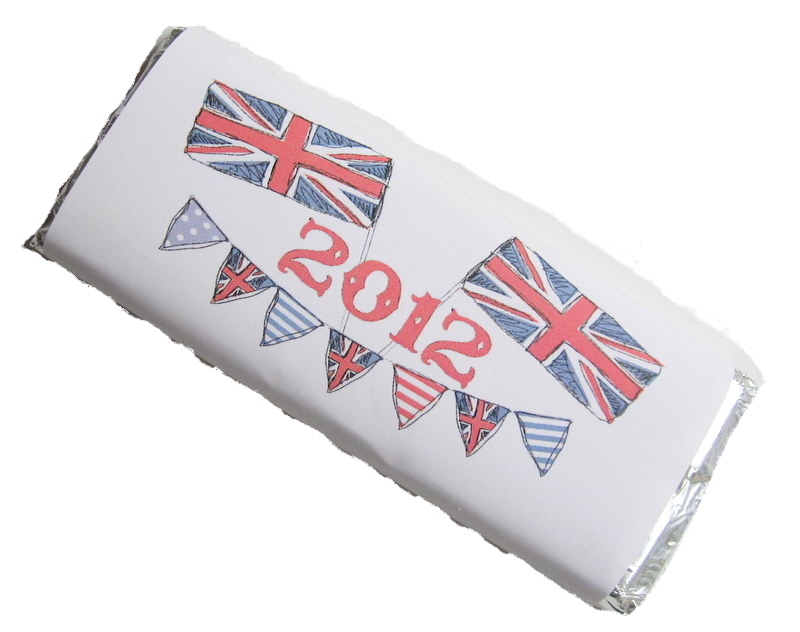 This chocolate wrapper design is exclusive to Funky Dory Party Bags, and you won't find it anywhere else. It is a lovely, vintage style flag and bunting motif, and is perfect for village fetes, school carnivals and street parties. We love it! This Celebrate 2012 design is also available on our printed cotton bags. Choose from the cotton tote bag or the cotton drawstring bag.